I often get asked about my setup for swing trading. I wish I had an extravagant answer. 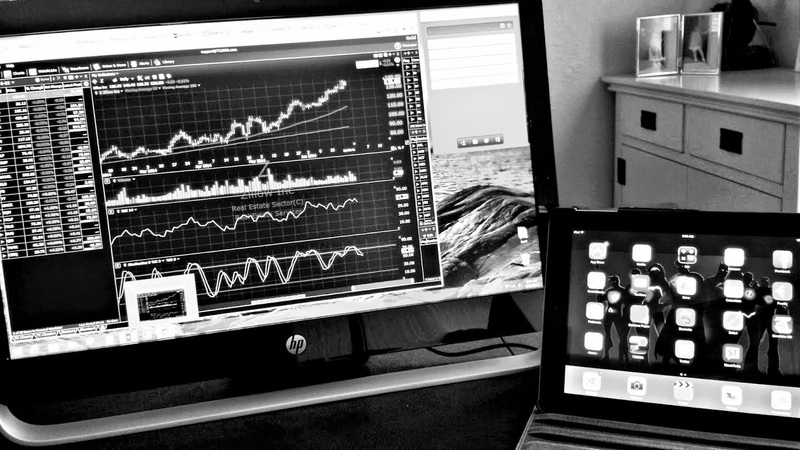 I love looking at pictures of trader setups that show 6 stacked monitors feeding every bit of data a person could ever want, but I follow a minimalist approach to trading. 1. One 27 inch “all in one” computer. This is a good mix of portability and power. I prefer not looking at a small screen all day, so I traded in my laptop for a bigger screen that still provides portability. The screen has a high resolution so I can split it when needing two sites up at the same time without having to tab back and forth. For instance, when I want my focus list and charts up from TC2000 and my broker in view at the same time. I recently added this to the setup only for blogging and the Trade Report. Here I view member emails and social media like twitter. I like to keep this separate from trading. I also use it to read when I have down time. That’s it. It is simple yet has everything I need to trade effectively. The best part is it keeps me from information overload, which can be a nightmare for swing traders. What is your stock trading setup? I want you to share in the comments below. If you like this article, follow me on twitter and retweet. What is Your Best Trade of the First Half of 2014? One PC with two 24 inch with Etrade. One Mac with two 23 inch for my mentor site, email, screenshare. Basically my eyesight stinks so bigger is better.